I think I’m the only person in the house that feels so jubilant about meat. In truth, if we want to live in a truly sustainable way concerning protein, we wouldn’t be eating meat at all because of the sheer amount of resources most meat uses in comparison to other vegetarian sources of protein. However, my food allergies to soy, wheat and dairy limit our use of vegetarian proteins. Thus, as long as we’re eating meat, we want to make sure we do it in a sustainable way for our local community, the planet and our health. And, since I’m the one who prevents us from going vegetarian, I volunteered to look into the pros and cons of various meat sources in our area. I used the following criteria to judge from where we would buy our meat: price, “localness” (I recognize that this is not a word, but I can’t think of a more appropriate synonym), quality, and flexibility. The five sources I compared were The Organic Butcher (local butcher near Matt’s work), Food Lion (large supermarket, as a sort of “control”), Horse & Buggy Produce (a local food cooperative), Polyface Buying Club (of the famous Joel Salatin’s farm), and Whole Foods (as another, more “granola” supermarket). Consider this the adult version of a science project – “Central Virginia Meat: A Comparison and Contrast”. I’m tempted to write it like a lab report, but I’ll restrain myself as I know that doesn’t make for interesting blog fodder. 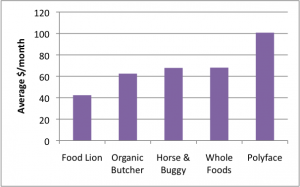 Price – no surprise here, using some rough math to estimate how much meat we use per month, Food Lion won. Second place was the Organic Butcher, and last place was Polyface. Polyface was significantly more expensive than the other options because they charge much more for chicken breasts ($13/lb.) than the whole chicken ($3.25/lb.) as a way to penalize those who don’t use the whole bird when cooking. Localness – Polyface won in terms of localness, mainly because we have visited their farm and we know that everything we buy from them is from just a few hours away. Horse & Buggy Produce’s localness has been called into question, and one time when Whitney was picking something up for the Organic Butcher the guy behind the counter said that they didn’t have any chickens because, “the truck hadn’t come in from New York due to the snow.” As for Food Lion and Whole Foods, there is no way to tell where their meat comes from. Quality – It’s very important for us to get antibiotic and hormone free meat, especially since I’m breastfeeding. Whenever possible, for ethical reasons, I also prefer grass-fed beef and pastured poultry. All except Food Lion offered meat with these labels. This alone ruled out Food Lion meat all together for us. Flexibility – The meat sources with brick and mortar stores (Whole Foods, Food Lion, Organic Butcher) win for their flexibility. They offer us the luxury of being able to buy meat every day in any amount. Horse & Buggy was the least flexible in that you had to commit to a fixed amount of meat for the whole growing season. For example, “we want 4 chickens a week from March – October”. What if you don’t want chicken one week? Too bad. You’re getting 4 chickens. The Polyface Buying Club was a little more flexible because it delivers to Charlottesville once a month, and you can change what you’re getting each month. In addition, they offer a wide variety of meat cuts and processed meats including bacon, lunch meat, hot dogs and sausage, unlike Horse & Buggy which gives you the whole animal. However, with Polyface, you still need to plan ahead what you’re eating for the whole month (who plans a whole month of meals at a time? Not us). After all of this extensive research, what did we decide? Well, we took the typical non-committal route and decided on splitting our meat consumption between two places. For meat we’re guaranteed to eat (ex. ground beef, chicken) we’ll buy it ahead of time from Polyface once a month, and for meat we need only for special recipes (ex. andouille sausage, bacon) Matt will pick it up from the Organic Butcher as needed. I believe the research was worth it. It feels good to be intentional about what you eat, to know you actively chose it and didn’t passively accept whatever was easiest. Good for you! I’ve been doing some reading about organic, sustainable, local foods recently, and I admire your desire (as an individual and a group) to make informed and intentional choices about your food. By the way, I’m looking forward to visiting the farm this summer!